Once in a blue moon, I would get an offer or invitation of doing something I would not do if I were to spend my own money. 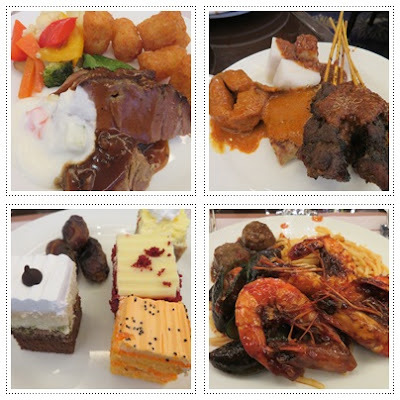 Because of someone's generosity (or two people actually), I had the chance to break fast buffet style at Grand Paragon Hotel, Johor Bahru. I was among the early birds to arrive at Para Para Restaurant, so I had the freedom to take photos before the crowd started to swarm around the food. There was a wide variety of food offered but the most exciting fact was that there were many stalls serving hot food to the visitors. those were all my plates of food, honestly no more. I had to remind myself not to eat too much as I had decided to rush to the nearest mosque right after. Everything was good and I had already put on more unnecessary weight towards the end of the fasting month. All the diet plan must have now gone down the drain. This must be the evil deed of Puan Mazzelina Mahmood but I would have to thank her for her kind gesture and I could for once break fast like a king. We still have not gone for our hi-tea PLC gathering as stated in our group's strategic planning so hope that could be carried out real soon.